Dalby�s Mick Shelford has stormed home to win Round 4 of the Steering & Suspension Warehouse Toowoomba Modified Sedan Club Championship Series which doubled as the PS Designer Homes Shootout. Shelford started from the second row and engaged in a titanic battle with Rodney Pammenter. 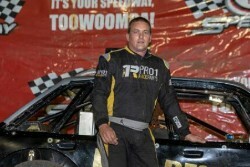 The two ran side by side for 15 laps before Shelford edged away to win the $1,000 to win twenty five lap feature race in front of a big Toowoomba crowd. Rodney Pammenter was galant in second and held off a fast finishing Aidan Raymont who was sent rear at the start of the feature race for a turn one incident. Raymont stormed from the back to the field against the fence to finish third in a very impressive drive. Nathan MacDonald hung onto fourth, while his brother Shane rounded out the top five. Heat wins went the way of Shane Langton, Rodney Pammenter, Nathan MacDonald and Shane MacDonald.